And a successful QC is accused and tried. This is the background of one of the most exciting court-room dramas ever to be written. 'Members of the Jury, are you agreed on your verdict?' The Clerk's voice was dusty - disinterested. Jack Roffey, apparently, worked in a courtroom, though in what capacity I don't know - my guess is as a Clerk. As a writer, his biggest success was the TV show Boyd QC, which ran for 78 episodes between 1956 and 1965, and starred Michael Denison and Charles Leno in a court-based series, kind of a British Perry Mason apparently. This is more of the same, really. 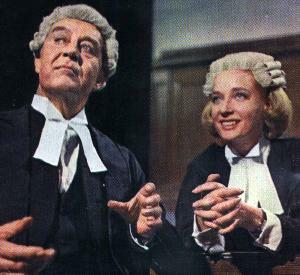 Hostile Witness was originally a West End play that transferred to Broadway and eventually got filmed by Ray Milland in 1968 in a version starring himself and Sylvia Sims. I don't think I've seen the movie (if I have, it doesn't exactly linger), but it's said to be a tad stagey. Wouldn't surprise me: this is the novelization of the film of the play, and it definitely shows traces of its theatrical origins. Essentially it's a courtroom drama and it has the requisite twists and turns of the form. The teenage daughter of a widowed QC is killed in a hit-and-run car accident, and the QC gets charged with murdering a judge who he believes was the driver. Except he doesn't really believe that. Or does he? After all, he had a nervous breakdown after his daughter's death, so who knows? The breakdown is far from being the most convincing element in the book, but once we're in court, things settle down pretty well. And it all kind of works, up to a point. The plot is sound, if unadventurous, and keeps you going, but it has to be said that the style does grate with Mr Roffey's fondness for the metaphorical turn of phrase, as in 'The Judge's voice was velvet, but his eyes were flint.' More a dramatist than a prose writer, perhaps. What does that laughter tell you about the values of the time? Mr Roffey's next work was another play, Justice is a Woman on which he collaborated with Ronald Kinnoch.